I’ve had kind of a down week. I’ve just waking up on the wrong side of the bed every morning, have been very short-tempered, and have generally had difficulty keeping my kettle from boiling over so far this week. I need something to cheer me up. 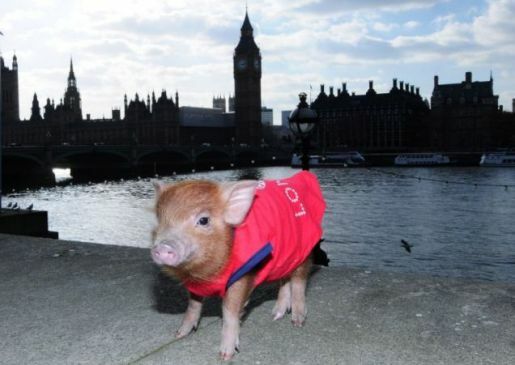 If you’re grumpy and gray today, then why not take a gander at Manuka, the teacup pig who took a whirlwind tour of London. If that’s not adorable enough to lift your spirits, if only for a moment, then you’re beyond help. Manuka is one of the teacup pigs, also called micro pigs or miniature pigs, raised by breeder Jane Croft in Christchurch, Cambridgeshire. I think the part that makes the pictures so cute is Manuka’s little costume, combined with her general tiny size. How adorable is that?! I just want to smush her little piggy face!